Tanya’s Travelling Tadpole Tuition offers a full range of swimming classes from complete beginners, through to competitive swimmers. 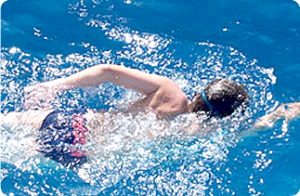 Our focus is to develop efficient and effective strokes so that our swimmers are well prepared for recreational or competitive swimming, and so that they have a highly developed understanding of the aquatic environment and water safety. 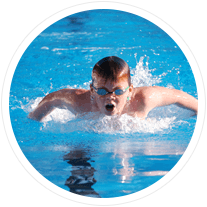 Our slogan “Swimming Skills for Life” means that the skills learned in our swimming lessons can not only potentially save lives, but that skills well taught will be kept for life. Naturally, we focus on making our lessons fun, because whilst water safety is vitally important, a love of water and enjoyment of swimming is a great asset in our environment. And of course we love teaching when everyone is having fun!! Class size is your choice, with up to 4 children max able to participate in a swimming lesson. The cost for a lesson is a flat fee, so the more children you include, the less it costs per child. However, a smaller child to instructor ratio means more instructor time for that child and ultimately more rapid improvement and skill development. 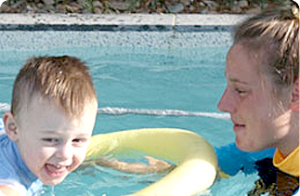 Tanya’s Tadpoles private swimming lessons are conducted by AustSwim qualified instructors who have also been trained in “TADPOLE TUITION” by Tanya. All swim instructors are required to hold current resuscitation certificates. 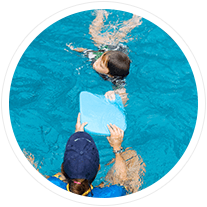 Tanya’s Tadpoles is an AustSwim recognised Swim School and is registered with ASSA.